Enjoying a nice warm bath? 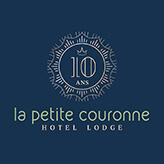 This can also be done at Hotel Lodge La Petite Couronne! In the Dutchtub. This bath is designed by the Dutch designer Floris Schoonderbeek, to approach the human being to nature. The bath is wood-heated. And stays on the most quiet spot with the most beautiful view. A unique experience, you really should try it. During your stay you remain private use of the Dutchtub when you stay in our Lodge “La Cabane des canards”.